A summer of building at the Stormwater Learning Center led to the creation of a beautiful Wilderness Traveler Canoe — just in time to hit the Mississippi before the weather took a turn. Learn about our partnership with the Mississippi Watershed Management Organization and East Side Neighborhood Services in their excellent blog post. There are now 16 more girls on the planet who can properly clamp, rivet, operate a drill, shave an edge with a radial plane, shape a thwart with a spoke shave, cut along a line with a Japanese saw, steam bend a rib, fare longitudianals, lash with sinew, and know the importance of sanding with the grain. These same young females in Iztchel Skovholt's sixth grade algebra class, at Laura Jeffrey Academy, a girl-focused middle school in St. Paul, also now know how to: collect data of the course of a project, plot numbers in a graph, identify patterns among those numbers, and summarize the results. They know how to do all of these things because they did them while building a 17 foot skin-on-frame canoe in their math class this semester. The girls collected data daily during the boat building portion, and then immediately applied those numbers in math class with Ms. Iztchel. For example, the students were able to measure the distance from the keel at center-line to the sheer on each rib. They saw what it looked like in their canoe as well as how the variations in depth affected the shape of the canoe. They then would go back to class, plot those numbers, and see how it looks on paper. They also saw the variations in the each person's numbers, even thought they were all supposed to be measuring the same thing; which is a lesson in itself. Iztchel and Hannah, our boatbuilding instructor, tailored the program to best meet the curriculum needs of the students. It is the first program in which Urban Boatbuilders has used the math-intensive Build To Teach model; which is part of a national program that uses small boat construction to help make sense of math for kids of all ages and levels. Building a boat with these girls gave them an opportunity to use new algebra skills in real-life; in addition to an increased sense of confidence, after successfully problem solving, making decisions and using their hands to create something as a team. After eight weeks, the students and I [Hannah] started to grasp the notion that in real life we actually DO use algebra (all the time). Dave Kapplehoff, an Urban Boatbuilders champion and teacher at Pines School, wanted Urban Boatbuilders to build a boat with his students. Unfortunately, he just couldn't find funding in the budget. Did that mean that his students wouldn't be able to participate? Nope. Dave and Urban Boatbuilders worked together in approaching the Pentair Foundation who generously agreed to partially fund the project, making it possible for 30 students at Pines School to begin building a West Greenland Kayak. Two days each week our Program Manager/Boatbuilding Instructor, Phil, drove up to the Anoka County Juvenile Center in Lino Lakes where Pines School is located. During his time there, he worked with up to 30 adjudicated youth teaching them more than just how to build a boat. It is truly incredible to see how Science, Technology, Engineering and Math are interwoven in every step of the building process. Students experienced hand-on learning, reinforcing the concepts they learn in the classroom. Beyond academics, an Urban Boatbuilders project builds communication skills, teamwork, perseverance, responsibility, and craftsmanship skills in the youth (without them even realizing it). Phil was impressed with the attentiveness, respectfulness, receptiveness and enthusiasm of the youth at Pines School. 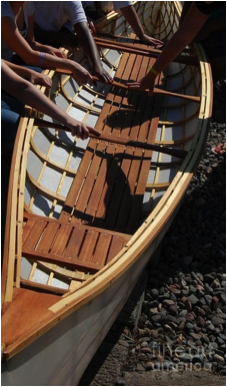 A boat and the hands that built it at Pines school in 2012. Check out the Northeast Metro 916 School District blog to learn more about our boatbuilding partnership!